Set out in the Texas statutes of 1879. So The Legal Genealogist is off today on another road trip… starting off in the Lone Star State of Texas… provided it hasn’t washed away by the time the plane is supposed to land this morning. I’m not entirely sure what Texas did to annoy Mother Nature, but man… the weather has been just appalling lately. So cross your fingers that there’s some sunshine for me and the Austin Genealogical Society — and if you’re looking for high ground, come join us tomorrow, Saturday, May 30th, at the Triumphant Love Lutheran Church on Great Hills Trail for an all-day seminar starting at 9 a.m. (the doors open at 8 a.m.). And in honor of that trip, another trip — into the Texas statute books. And that’s where it is. In black and white. In those Texas statutes of 1879. Well, okay, they could if they lived in some counties. Which sounds like a lot until you figure Texas had 226 counties in 1879. So… what the heck is a prairie chicken? I mean, really, I live in the northeastern United States. We have city chickens (otherwise known as pigeons). But we don’t have prairie chickens. Which our ancestors could kill, and presumably eat, in the months from July through February. Could you have gotten through the day without knowing that? It mattered where the hunter lived? Not where the chicken lived? Not much sense to that! All the rain is just to offset the extreme drought conditions we’ve had in much of Texas the last few years. Stay dry and enjoy your time in Austin. I lived in Texas long enough to be a citizen before I mustered out of the service. I can’t cry fowl because I didn’t see any prairie chickens running around on base. But I have seen some ugly weather. No ugly weather today — no prairie chickens, either, at least not so far! That pinnated grouse is a beauty. I wonder what the reason was for the hunting restrictions? Perhaps something to do with breeding season? Ok, I confess. These things matter to me. 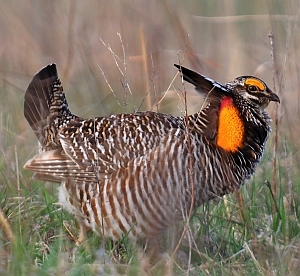 Especially the prairie chicken being endangered. Not a Texan, and so far as I know, none of my family ever lived there. But I grew up in the dry part of the west and love love love my version of wild “chickens” (western grouse and quail) that I have a welcome sign over my front door here in damp Vermont featuring those sweetest of all, the plumed California quail, who paraded through my grandparents’ Siskiyou foothills farm with their young. Happily not endangered. Hope Texas recovers from the floods and awful weather, and that the prairie chicken bounces back too. Enjoy your stay there. Who would have thought that Texans of 1879 would have been conservationists? The season is undoubtedly related to the breeding season of the prairie chicken – by not hunting them during breeding season you help to perpetuate the population. These days all you would hear would be gun and property rights arguments for shooting prairie chickens whenever and wherever. The market has the sense to know not to eat seed corn and the same way knows not to mess with breeding season. I probably could have gotten through the day without the information on the Prairie Chicken… maybe… but I’m glad I didn’t have to. You have brought back some good memories. I grew up in northern British Columbia where we often enjoyed Prairie Chicken for supper. One of my favourite memories was my youngest brother challenging our Dad to a ‘feather plucking contest!’ As my brother started to furiously pluck feathers my Dad asked him how much longer he was going to take as there were several chickens to clean. On a Prairie Chicken you usually only eat the breast meat so my Dad had quickly opened the bird and removed the breast meat with nary a feather plucked. Aww.. the good ol’ days! Must admit though, I don’t miss the outhouse or heating water so you could take a bath. Thanks Judy! Glad to help with the trip down memory lane! As a birder as well as a genealogist, I have, perhaps a different view of the prairie chicken. I lived in southern Wisconsin for 15 years, where the prairie chicken was close to being an endangered species, since its habitat was small patches of real prairie. This bird’s mating habits are strange and endearing. During most of the year, those orange patches aren’t visible. And the birds live in fairly dispersed prairie areas. But in the “forbidden” months, they congregate on mating grounds called a “lek,” males and females together. Before dawn, the males inflate those orange “eyebrows” and the orange pouches in their throats, with which they make loud booming noises, to compete with other males and attract mates. So all the prairie chickens within miles are congregated in one place, and are sitting ducks for hunters, if you don’t mind my mixing my fowl metaphors. And that is the reason for the early Texas law against hunting them during mating season in the counties where they mated. I once went on an Audubon Society trip to watch the prairie chickens on the lek; we had to hike several miles to be in the blind by something like 4:00 am on a brutally cold morning, and stay totally silent until the birds all left at about 8:00, when the sun was fully up. What an amazing sight! This was in the mid 1980s, and I’ve never forgotten it. I think they’ve discontinued such excursions, as prairie chickens are now even more endangered. They are indeed a very endangered species these days, Doris, and I’m sure it was to protect the breeding season that the original laws were enacted.